1. 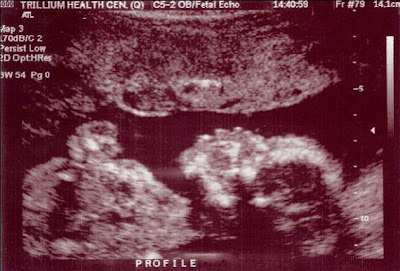 The baby was so damn adorable during the ultrasound. The cutest little head and face (atleast what I could make out). Even waving little arms at the camera... I think I may be raising a celebrity, or politician. The picture shows a profile of the baby's head, neck and upper body. Yes, I have kept away for the last week or so because I did indeed have a cold. The sick feeling that I started to write in my last post materialized, despite the Vitamin C, hot water and honey, lemon, and gargling with salt water. I tried my most loved pantry remedies, to no avail. I was sick. And there's not much you can do about it when you're pregos I've learned. Other than wait for it to run it's course. Not so fun week. And having to spend a whole lot of time at the computer last week writing, re-writing and re-writing presentations has given me some wicked Pregnancy Carpal Tunnel in my right hand. Given that I'm at a desk all day, I'm sure it was inevitable, but damn. It's the kind of pain that keeps you up at night, the kind of hurt that forces you to hold cups with the other hand and kind of strain that has you screeching when you move it just slightly (I caught a closing door in my underground parking garage this morning and I swear my moans were echoing). I got into work today and ordered padding for my keyboard and mouse. Heading over the drugstore this afternoon for one of those braces. The pain is getting worse, not better. But if this is all that I can complain about - a head cold and sore wrist - than I'm doing pretty good. Baby is fantastic (more on that in another post) and everything is going well. To be honest, it probably has very little to do with the baby but I just wanted to share that I feel like crap. Rant 1: I woke up today with what it think is the start of a cold. My throat is itchy, my eyes are watering, and I just wish that I could have stayed home. Rant 2: My first meeting of the day was stupid. One of those kinds of meetings where you spend an hour looking at a table of results and talking at nausem. How did we do against last month, and last year? What’s up and down? Most of the conversation was circular. There goes an hour that I will never get back again. Rant 3: Then I found out that the presentation that I am giving to the senior management team tomorrow is CORRUPTED, AGAIN. When the file originally corrupted on Friday our IT Team could don’t anything about it. I spent the weekend redoing it and saved it as two separate files. Even though it was fine on Monday, it’s now CORRUPTED, AGAIN. If I have to redo this presentation again tonight for tomorrow I will freak out. Rant 4: I am so tired right now, I just want to go home, crawl into my bed and hid under the covers. Wake me up when I have to deliver this baby. Just got back to from my first appointment with the new OB/GYN. Happy to report that she isn't like Kathy Bates in Misery. She's pleasant, positive, speaks very slowly, nods aggressively, has very expressive eyes. I'm sure those are all good signs in a doctor, and maybe a guidance counseller. The bigger than norm UT could be something. It could be nothing. But the new doc is really eager for me to have that ultrasound I scheduled for weeks from now. The one that I have been putting off. The one that may tell us what I'm having. Damn medical community and their testing. I may have to move that appointment up. My procrastination is not really working out at the moment, on a number of levels. I'm really not DWELLING on the whole not being able to find an OB/GYN thing. Really, people, I am not. I just couldn't help but post an article that broke on the Globe and Mail, Canada's largest national newspaper, yesterday. So for your reading pleasure, "Obstetrician shortage looming, group warns" by Canadian Press reporter Helen Branswell. Enjoy! TORONTO — Canada faces a critical shortage of obstetricians, the professional group representing this type of medical specialist warned Thursday. The Society of Obstetricians and Gynaecologists of Canada said mothers and their babies will be put at risk unless substantially more obstetricians are trained in coming years. “Women are stressed because they can see that if they're going to live in Fort McMurray and there are only two doctors there in a city that's over 100,000 ... and both of them are over 55 years old, it doesn't look pretty good,” Dr. Andre Lalonde, executive vice-president of the society, said Thursday. The organization released results of a survey it conducted among members, looking at how many obstetricians and gynecologists are delivering babies, how long they intend to practice as well as how medical residents in the specialty plan to structure their work hours. They found only 1,370 obstetricians are currently providing prenatal, antenatal — birthing and delivery — and postnatal care. That number is forecast to drop by as much as a third over the next five years, the report on the survey results said. Younger doctors — predominantly women — don't want to work the round-the-clock schedules of obstetricians of old. Many plan to take breaks in their careers to have children and don't want to spend as much time on call, the survey found. “They want to have a better work-life balance than the ones who are retiring right now,” Dr. Lalonde said. The society is calling on governments to increase the number of medical school spots for obstetrics and gynecologists by 30 per cent a year for three years. That means training about 25 or 30 extra doctors in this specialty a year, Dr. Lalonde said. After that an additional 10 per cent apiece for three years is needed, the group said. They also recommended rotating medical residents in the specialty into smaller cities and towns in the hopes it might encourage some to practise later in smaller centres. Small towns and rural areas have a chronic shortage of doctors of all specialties. The organization is also calling for training of more midwives, who could take on more of the standard deliveries, freeing up physicians to handle the complicated births and the emergencies. I had to steal this picture of Angelina and Brad from another blog that I read earlier today. Angelina was days before giving birth to her twins, walking the red carpet. As fabulous and skinny as Angie is ALL THE TIME, she is huge in this picture. She, like many mothers before me was forced to wear the dress/mu-mu/tent. And she's Angie. I'm sure designers were throwing their creations at her. So I am saving this picture on my blog. When I feel like I'm drowning in my ever expanding humps and bump, I will refer back to this picture. If Angie, in all of her celebrity fab-ness can do it, on the red carpet, knowing that there will be eyes on her and future photo evidence, I can too. The first appointment with my new OB/GYN is tomorrow afternoon. This is the person that my family doctor secured for me. I haven't been able to find any information online for her, and as a result the unknown is making me extremely nervous. I just had a flash back to Kathy Bates in Misery, circa early 90s. T E R R I F I E D.
It could be really bad guys. Wish me luck. I will let you know how it went.